The unscripted series will follow five emerging hip-hop artists in a bid to be groomed into the next big rap star. Lifetime is getting into the hip-hop game.Following the success of Fox’s Empire, the female-skewing cable network is teaming with Queen Latifah and Jermaine Dupri for a new unscripted series called The Rap Game.The eight-episode unscripted series, set to premiere on New Year’s Day, follows five emerging artists ages 12-16 who will be immersed in the Atlanta hip-hop scene in a quest to become the next big rap star. Producer Dupri will be joined every week by such guests as Usher, Ludacris, Da Brat, T.I. and Silento to help mold the kids into the next big young rapper and earn a record contract with their mentor’s So So Def Recordings label. 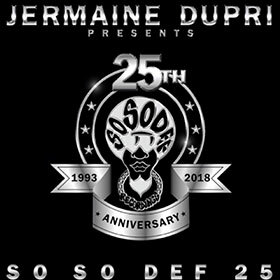 During his more than 30-year career, Dupri has worked with young talents including Bow Wow, Da Brat, Kris Kross and TLC. Dupri will exec produce alongside Latifah and her Flavor Unit partner Shakim Compere. The Rap Game is additionally produced by Intuitive Entertainment, Mechelle Collins and Kevin Dill (The Millionaire Matchmaker), showrunner Sean Rankine (Basketball Wives), Laura Fuest Silva (America’s Next Top Model) and Chris Deaux (Rods and Wheels). Lifetime’s Eli Lehrer, Mary Donahue and Mariana Flynn oversee in for Lifetime. Filmed in Atlanta, the series will air Fridays at 10 p.m.
“Hip-hop is where Latifah and I came from so it’s great to be able to produce a television show that is derived from our roots. The show is going to be a lot of fun,” Compere said. For Lifetime, The Rap Game comes as both broadcast and cable networks alike are looking to tap into the success of Fox’s hip-hop soap Empire. VH1 on Jan. 4 will premiere The Breaks, a TV movie based on Dan Charnas’ best-selling book The Big Payback: The History of the Business of Hip-Hop, which is considered one of the most comprehensive accounts of hip-hop; while Starz has found ratings success with its 50 Cent-produced hip-hop drama Power. On the unscripted side, WE tv has picked up an Empire-like docuseries Growing Up Hip Hop, featuring the aspiring offspring of music legends Damon Dash, Rev. Run, Russell Simmons and more. Lil’ Niqo has been making music history since he was 10. He was the youngest rapper signed to Island Def Jams and was a correspondent for BET and MTV’s red carpets. Lil’ Nigo also appeared on the drama The Finder, working alongside 50 Cent, Michael Clarke Duncan and Jacob Latimore. With his “momager” Nique by his side, there’s no stopping Lil’ Niqo’s path to success.Lil’ Poopy, 12, Brockton, MAThe youngest in the group, Lil’ Poopy has made more than 200 videos, writes his own songs and has performed with Puff Daddy, Rick Ross and French Montana. His father and mentor, Luis Rivera Sr. will do anything to see his son rise to the top — including hiring the hottest models and renting out Ferraris for his son’s music videos.